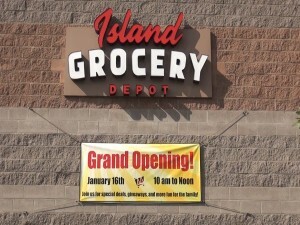 Flying cash, free food and a friendly Mr. Peanut were among the perks at Island Grocery Depot’s grand opening celebration in Lahaina. 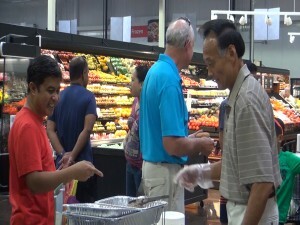 KPOA hosted a 10-second Money Machine cash-grab for customers, who also enjoyed food samples throughout the store, from ice cream to noodles to hamburgers. It’s a taste of what the 11,584-square-foot building has to offer, with more than 5,000 items on the shelves. 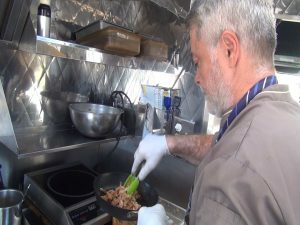 Romo says customers have called the store “a mini-Costco,” and he hears many positive comments about the wide selection of fresh produce, frozen seafood and fresh-cut meats, with trained butchers among the store’s 30 employees. There is no membership needed to shop at Island Grocery Depot, which will begin taking EBT cards in about a month. 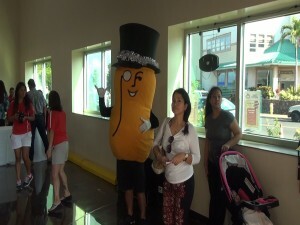 Mr. Peanut greets customers at Island Grocery Depot in Lahaina. Photo by Kiaora Bohlool. Customers grab cash as fast as they can in KPOA’s Money Machine, part of Island Grocery Depot’s grand opening celebration. 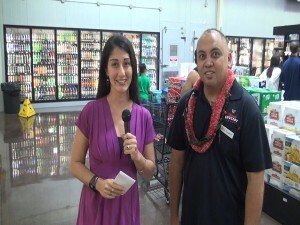 Kiaora Bohlool interviews Island Grocery Depot assistant manager Russell Romo. Cashier at Island Grocery Depot in Lahaina. Photo by Kiaora Bohlool. 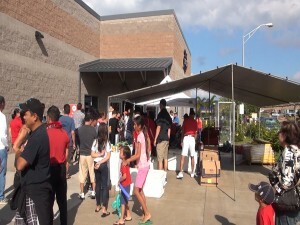 Crowds celebrate the grand opening of Island Grocery Depot in Lahaina. Photo by Kiaora Bohlool. 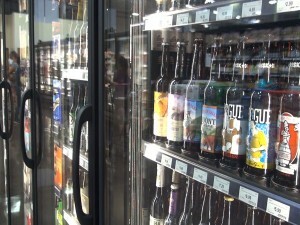 Craft beers at Island Grocery Depot in Lahaina. Photo by Kiaora Bohlool. 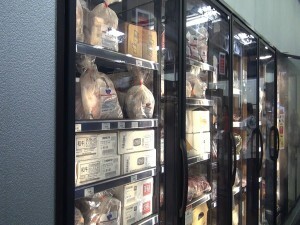 Frozen seafood and meats at Island Grocery Depot in Lahaina. Photo by Kiaora Bohlool. 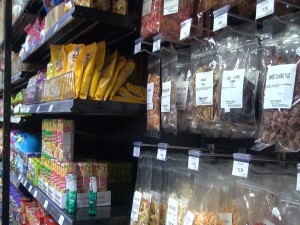 Local snacks for sale at Island Grocery Depot in Lahaina. Photo by Kiaora Bohlool. 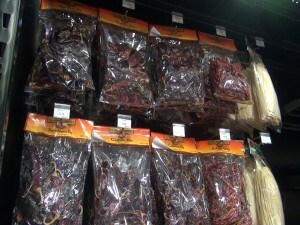 An assortment of dried chili peppers on the shelves at Island Grocery Depot in Lahaina. Photo by Kiaora Bohlool. Specialty produce is among the unique items at Island Grocery Depot in Lahaina. Photo by Kiaora Bohlool. 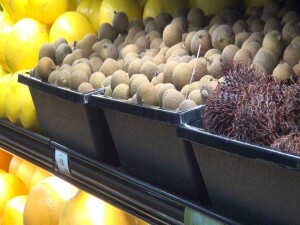 Organic produce at Island Grocery Depot in Lahaina. Photo by Kiaora Bohlool. 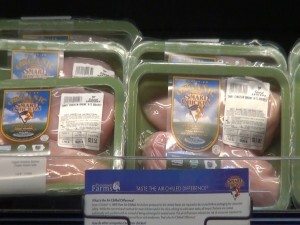 Organic chicken on the shelves at Island Grocery Depot in Lahaina. Photo by Kiaora Bohlool. 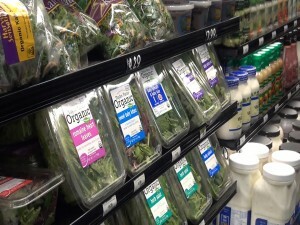 Shoppers check out the produce at Island Grocery Depot in Lahaina. Photo by Kiaora Bohlool. 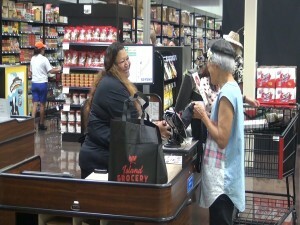 Island Grocery Depot store celebrates its grand opening in Lahaina. Photo by Kiaora Bohlool. The business first opened in 1986 as Cash N Carry Warehouse in Kahului, then changed the name to Island Grocery Depot last year to better reflect its mission of serving Maui’s families. 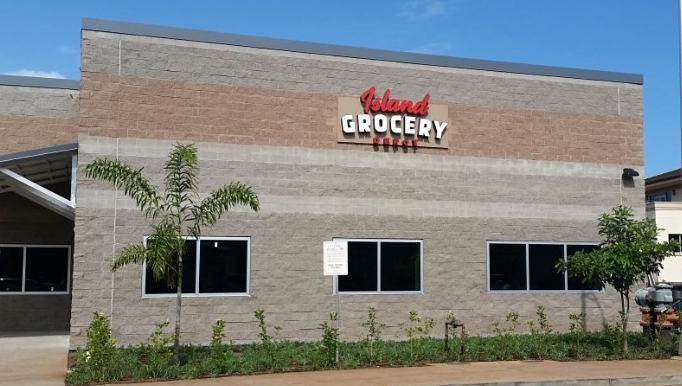 The new Lahaina store is about 3,000 square-feet Island Grocery Depot larger than the Kahului location, and remains locally and family-owned. 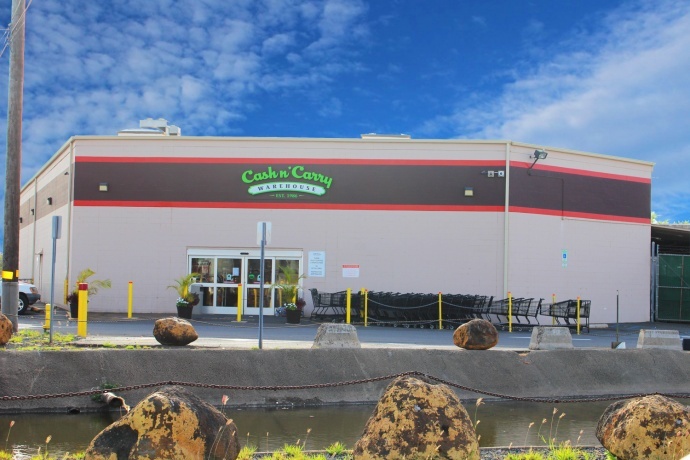 The two stores, along with business food supplier VIP Foodservice are divisions of Valley Isle Produce, founded in 1950 by Roy Okumura. Both stores are open seven days a week, 6:30 a.m. to 7 p.m. weekdays, and until 6 p.m. on weekends. The ￼￼Lahaina location is at 58 Kupuohi St. in Lahaina Industrial Park. Call (808) 866.5020 or click here for job applications, exclusive store specials, grocery tips and more.